Spine and Back Patients in Brandon Florida will find that choosing Joseph Spine will make advanced spine care options, office visits with access to highly trained spine specialists/surgeons, and follow-up appointments easier and less stressful – all important components that our physicians recognize as crucial to patients’ successful healing and recovery. Joseph Spine treats a wide variety of spine disorders such as scoliosis and deformity, kyphosis correction, cervical spine disorders, neck pain, back pain, degenerative disc disease, degenerative spinal conditions, herniated disc, lumbar spine disorders, spinal stenosis, spondylolisthesis, and thoracic spine disorders. Joseph Spine treats these conditions with many different techniques. A Joseph Spine, our mission is to provide our patients with state of the art spine care. Our spine centers are conveniently located throughout Tampa Bay with offices in Tampa, St. Petersburg and Safety Harbor, and now adding our newest location in Brandon Florida. Our patients come to us in pain and we use our expertise in diagnosis, education, and treatment to help move them forward to improved spine function and health. Our team has over a decade of experience and expertise in providing advanced spinal care and innovative procedures including, but not limited to those below. 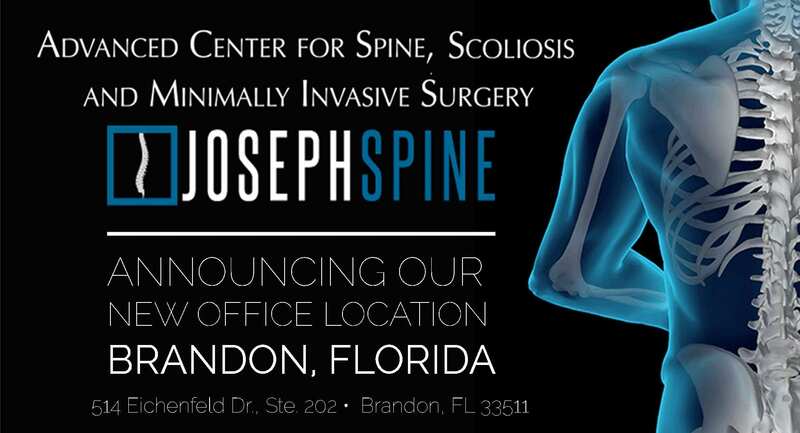 Joseph Spine is an advanced center for spine, scoliosis and minimally invasive surgery. Founded by Dr. Samuel A. Joseph, a fellowship trained, board-certified orthopedic surgeon. His practice includes the specialized, conservative, and surgical care of patients. Treatment includes therapeutic injections, disc replacement surgery, minimally invasive techniques, and complex reconstruction of adult and pediatric spinal disorders. Dr. Joseph is also among a select group of surgeons to offer cutting-edge regenerative injection therapy. 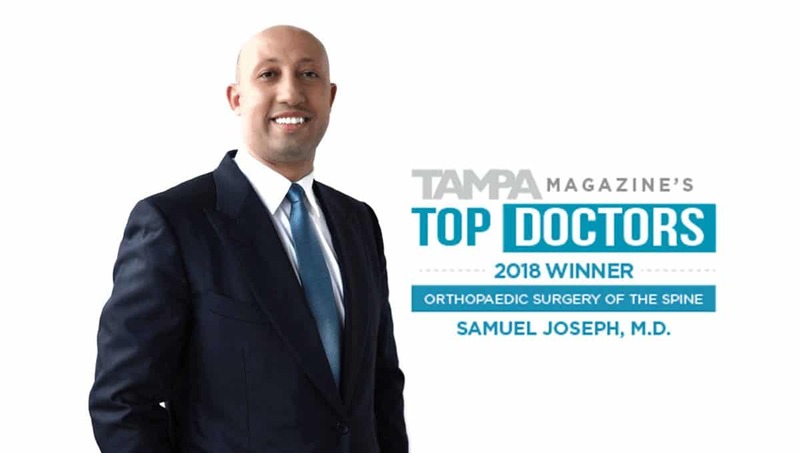 Dr. Samuel Joseph, Jr., of Tampa, FL has been honored with the recognition of Tampa Magazine’s Top Doctors, in the category of Orthopaedic Surgery of the Spine. 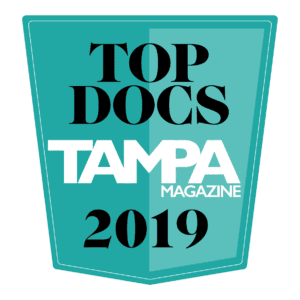 The doctors selected for Tampa Bay’s Top Doctors have been rated by their peers as doctors with the highest level of ethical standards and professional excellence. Dr. Joseph is a board certified, fellowship-trained, orthopaedic surgeon who specializes in advanced spine care. He is the founder of Joseph Spine Advanced Center for Spine, Scoliosis, and Minimally Invasive Spine Surgery. Dr. Samuel Joseph offers the latest technological treatment advances for spine care making Joseph Spine, a comprehensive, multidisciplinary spine care institute designed to create better outcomes for spine and back patients regionally, nationally and internationally. Dr. Joseph and his family are active members of the Tampa Bay community. They have taken a special interest in the Make a Wish Foundation and its goal of granting wishes and making life better for kids with life-threatening medical conditions. He also lends his time to the Butterfly Foundation, which brings deformity focused spine surgeons and comprehensive teams to developing countries to teach local spine surgeons through didactics, workshops, and surgery on local patients. Regenerative Injective Therapy (RIT) using stem cells is a cutting-edge new procedure that triggers the body’s natural healing mechanisms, relieving pain and often curing the cause. The emerging field of regenerative medicine features stem cell-based therapies using autologous platelet rich plasma/fat/bone marrow which are at the forefront of sports and regenerative medicine worldwide. RIT offers a promising new option for treating those who suffer from chronic back pain. Tampa, FL April 7, 2017 – Dr. Samuel Joseph offers the latest technological treatment advances for Spine Care making Joseph Spine Advanced Center for Spine, Scoliosis, and Minimally Invasive Surgery, a comprehensive, multidisciplinary spine care program designed to create better outcomes for patients regionally, nationally and internationally. Dr. Joseph’s practice includes the specialized, conservative, and surgical care of patients. Treatment includes therapeutic injections, disc replacement surgery, minimally invasive techniques, and complex reconstruction of adult and pediatric spinal disorders. He is among a select group of surgeons to offer cutting edge regenerative injection therapy (RIT), a procedure that harnesses the body’s natural ability to heal itself. Joseph Spine utilizes Lipogems® for stem cell therapy. Dr. Joseph has used his training and experience to become a leader nationwide on revision surgery for patients who have experienced failed surgery in the past. Dr. Joseph is active in teaching his minimally invasive techniques, complex scoliosis procedures and revision strategies to surgeons across the United States, as well as internationally, including China, Russia, Poland, Turkey, Ukraine, and Switzerland. Dr. Joseph has published numerous articles in neurosurgical and orthopedic spine journals. His research on scoliosis, degenerative disc disease, and spinal surgery in the elderly has been presented at many international meetings including the International Meeting for Advanced Spinal Techniques. Tampa, FL – March 2, 2017 – Joseph Spine, recently opened it doors in December of 2016, with spine centers in Tampa, St. Petersburg and Safety Harbor Florida. Joseph Spine’s patient-focused spine care program operates under Dr. Samuel A. Joseph, Jr., who is committed to finding the best treatment approach for each patient.